Hello lovely readers of Caught up in Cake! I’m Charlie from the blog Charlestown Vintage, a little blog about the life of a 19 year old student, with outfit posts, days out, recipes and other snippets of whimsy. I’m guest posting for the lovely Katy whilst she’s in the process of her house move, hope it’s all going well! I’ve never guest posted before, so was a little bit of unsure of what to post, but decided on I’m used to! This is one of my University outfits, I really love the whole pencil skirt craze going on at the moment, I never thought they’d suit me, but when I saw this one with velvet polka dots in the sale for only £10 I had to snap it up! 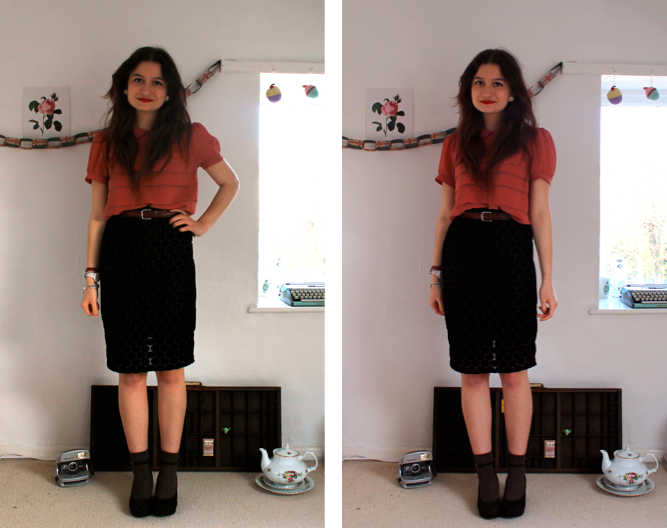 It’s a mega tight skirt, if you can tell from the pictures, but it makes me feel pretty grown up and sophisticated, ha! What do you all think of the pencil skirt trend at the moment, yay or nay? I’ve seen some really pretty ones in River Island, with polka dots and dogteeth prints! One thing that I look forward to with spring clothing is the socks and shoes combination, I always get a bit wary of the drastic change between tights and bare legs, so socks is a bit of a halfway point, and I love how they look with brogues and loafers. I wore my new wedges in this post, but there’s no way I’d wear them to University, I’m so clumsy and could just imagine myself slumping off the bus in-front of the rest of Uni! Hope you’re all enjoying March so far, if the weather so far is anything to go by, it’s going to be a lovely month!